NEB recommends NEB 10-beta Competent E. coli , High Efficiency (NEB #C3019) for assemblies larger than 15 kb. 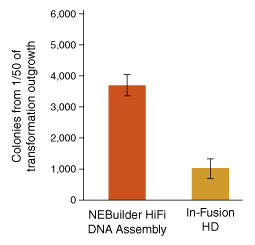 NEBuilder® HiFi DNA Assembly Bundle for Large Fragments offers a discount for purchasing these competent cells with the NEBuilder HiFi DNA Assembly Master Mix. 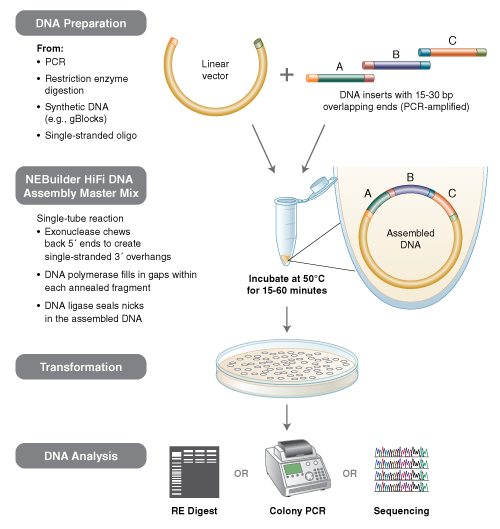 NEBuilder HiFi DNA Assembly Master Mix was developed to improve the efficiency and accuracy of DNA assembly. This method allows for seamless assembly of multiple DNA fragments, regardless of fragment length or end compatibility. This method has been used to assemble either single-stranded oligonucleotides or different sizes of DNA fragments with varied overlaps (15–80 bp). It has utility for the synthetic biology community, as well as those interested in one-step cloning of multiple fragments due to its ease of use, flexibility and simple master-mix format. NEB recommends NEB 10-beta Competent E. coli (High Efficiency, NEB #C3019) for assemblies larger than 15 kb. NEBuilder HiFi DNA Assembly Bundle for Large Fragments offers a discount for purchasing these competent cells with NEBuilder HiFi DNA Assembly Master Mix. The end result is a double-stranded fully sealed DNA molecule that can serve as template for PCR, RCA or a variety of other molecular biology applications, including direct transformation of E coli. NEBuilder HiFi DNA Assembly Cloning Kit is supplied with NEB 5-alpha High Efficiency Competent E.coli. NEBuilder HiFi DNA Assembly kits are available in various formats: with NEB 5-alpha competent cells (Cloning Kit, NEB #E5520), as a bundle with NEB 10-beta competent cells (Bundle for Large Fragments, NEB #E2623) and without competent cells (Master Mix, NEB #E2621) . NEB 5-alpha competent cells cells are excellent for routine assemblies of 15kb or less. NEB recommends NEB 10-beta Competent E. coli (High Efficiency, NEB #C3019 ) or NEB 10-beta Electrocompetent E. coli (NEB #C3020) for assemblies larger than 15kb. If the assembled genes contain repetitive sequences, NEB Stable Competent E. coli (NEB #C3040) should be used. For help designing your primers for use with NEBuilder, please view our primer design video. Reactions were set up in a 2- and 6- fragment assembly reaction according to recommended reaction conditions. 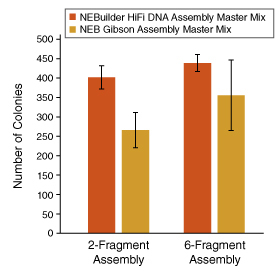 NEBuilder HiFi DNA Assembly results in larger numbers of colonies over NEB Gibson Assembly, for both 2- and 6-fragment assemblies. Two-fragment reactions were set up using the positive control from the In-Fusion HD Cloning Kit (Clontech Takara Bio USA, Inc), according to recommended protocols. 2 μl of assembly reaction was transformed into supplied competent cells. 1/50 of outgrowth was spread on an ApR plate. Enjoy less screening/re-sequencing of constructs, with virtually error-free, high-fidelity assembly. Use one system for both "standard-size" cloning and larger gene assembly products, up to 6 fragments. Move on with your workflow, because DNA can be used immediately for transformation or as template for PCR or RCA. Adapts easily for multiple DNA manipulations, including site-directed mutagenesis. For generating PCR Products, we recommend Q5® High-Fidelity DNA Polymerase (NEB #M0491 ) or related products, such as Q5 Hot Start High-Fidelity DNA Polymerase (NEB #M0493 ) or Q5 Hot Start High-Fidelity 2X Master Mix (NEB #M0494 ). LB (Luria-Bertani) plates with appropriate antibiotic. For selection of transformed competent cells, we recommend LB plates with appropriate antibiotic. You will receive 3 separate products when you order this bundle: 2X (NEB #E2621S) and 1X (NEB #C3019H) (competent cells will arrive in a separate box containing dry ice). Store the NEBuilder HiFi DNA Assembly Master Mix and positive controls at -20°C. Store the NEB 10-beta/ Stable Outgrowth Medium at 4°C. Store the competent cells at -80°C. DNA:PCR product purification is not necessary if the total volume of all PCR products is 20% or less of the assembly reaction volume. Higher volumes of PCR products may reduce the efficiency of high-fidelity DNA assembly and transformation due to the elevated carryover amounts of PCR reaction buffer and unused primers present in the PCR product. Column purification of PCR products may increase the efficiency of both high-fidelity DNA assembly and transformation by 2-10 fold and is highly recommended when performing assemblies of three or more PCR fragments or assembling longer than 5 kb fragments. Purified DNA for assembly can be dissolved in ddH2O (Milli-Q® water or equivalent is preferable), TE or other dilution buffers. Insert: When directly assembling fragments into a cloning vector,the concentration of assembly fragments should be at least 2 times higher than the concentration of vector. For assembly of 4 or more fragments into a vector, we recommend using an equimolar ratio of fragments. Biology: Some DNA structures, including inverted and tandem repeats, are selected against by E. coli. Some recombinant proteins are not well tolerated by E. coli and can result in poor transformation or small colonies. I am not sure whether to choose NEBuilder HiFi DNA Assembly or NEB Gibson Assembly? How are the products different? What are the advantages of this method compared to traditional cloning methods? What is the largest single fragment that has been assembled with NEBuilder HiFi DNA Assembly Master Mix? How many fragments of DNA can be assembled in one reaction? What are the shortest overlaps that can be used with this assembly method? Can ≤ 200 bp dsDNA fragments be assembled by this method? Can ssDNA oligonucleotides be assembled with dsDNA fragments? Can longer or shorter incubation times be used? Will the reaction work at other temperatures? Is it necessary to purify PCR products? Is it necessary to inactivate restriction enzymes after vector digestion? I would like to produce overlapping dsDNA fragments by PCR. Do I need to use PCR primers that have been purified by PAGE or HPLC? I would like to assemble ssDNA oligonucleotides into dsDNA fragments. Do I need to use oligonucleotides that have been purified by PAGE or HPLC? Can I PCR-amplify the assembled product? What should I do if my assembly reaction yields no colonies, a small number of colonies, or clones with the incorrect insert size following transformation into E. coli? How can I reduce the number of vector-only background colonies? Can I use electroporation instead of chemical transformation? Are there any differences between the requirements for 2–3 fragment assemblies versus 4+? Can I use PCR product amplified from Taq DNA polymerase? Can I Use other primer design tools such as SnapGene for Gibson Assembly, to design primers for NEBuilder HiFi DNA Assembly? Are there any differences between NEBuilder HIFi DNA Assembly Master Mix, the NEBuilder HiFi DNA Assembly Cloning Kit and NEBuilder HiFi DNA Assembly Bundle for Large Fragments? What type of competent cells are suitable for transformation of DNA constructs created using NEBuilder HiFi DNA Assembly Master Mix? Can I use a 15-nt overlap that is entirely composed of His-tag repeats (i.e., CACCACCACCACCAC)? Is this method applicable to the assembly of repetitive sequences? What is the difference between NEBuilder HiFi DNA Assembly Master Mix/DNA Assembly Cloning kit/Bundle for Large Fragments kit and the current NEB Gibson Assembly Master Mix/Cloning Kit? Limited Warranty: The NEBuilder® HiFi Assembly Master Mix is warranted to perform according to specifications stated on the certificate of analysis. No other warranty is made, whether express or implied, including any warranty of merchant ability or fitness for a particular purpose. This warranty limits NEB’s and its licensors’ liability to only the price of the product. Neither NEB nor its licensors shall have any responsibility or liability for any special, incidental, indirect or consequential loss or damage whatsoever. NEW ENGLAND BIOLABS®, NEBUILDER®, Q5®, HF®, NEBIOCALCULATOR® and SHUFFLE® are registered trademarks of New England Biolabs, Inc.
CUTSMART™ is a trademark of New England Biolabs, Inc.
GIBSON ASSEMBLY® is a registered trademark of Synthetic Genomics, Inc.
MILLI-Q® is a registered trademark of Millipore, Inc.
NANODROP® is a registered trademark of Nanodrop Technologies, Inc.
NEBuilder Assembly Tool 2.0 What’s New?